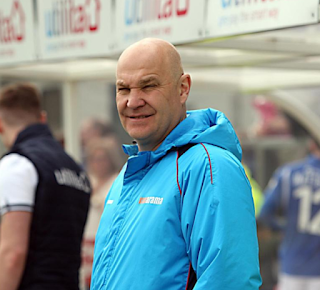 Eastleigh were held to a 0-0 stalemate by ten-men Aldershot at the Silverlake Stadium. The Shots were reduced to ten men when Kodi Lyons-Foster was dismissed on 36 minutes. Spitfires manager Richard Hill's post-match reaction: “Unbelievably frustrated. "It’s always difficult against ten men but the tempo and urgency just wasn’t there today. Next up for the Spitfires is a trip to Ebbsfleet United on Saturday. Eastleigh: Ross Flitney, Ayo Obileye (Danny Hollands, 85), Michael Green, Sam Togwell (Chris Zebrsoki, 71), Andrew Boyce, Callum Howe, Sam Wood, Sam Matthews, Ben Williamson (Reda Johnson, 46), Craig McAllister, Mark Yeates. Subs: James Constable, Cavaghn Miley. Attendance: 2,525 (542 from Aldershot). 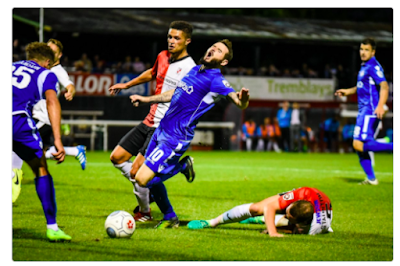 Eastleigh were cruelly denied all three points as Leyton Orient netted an equaliser deep into stoppage time to cancel out Ayo Obileye's penalty for the Spitfires. Watch highlights from Eastleigh's 2-0 win over Tranmere. 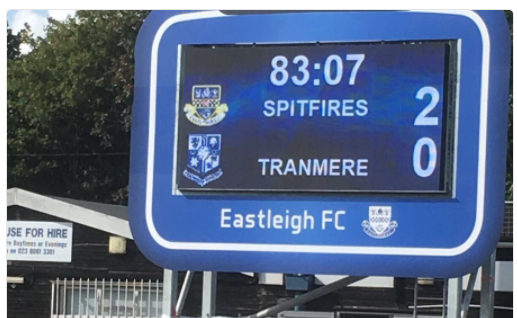 Ben Williamson's fourth goal of the season and a Craig McAllister header saw Eastleigh put in a professional display to beat Tranmere by two goals to nil at the Silverlake Stadium. Eastleigh: Ross Flitney, Ayo Obileye, Sam Wood, Sam Togwell, Andrew Boyce, Callum Howe, Danny Hollands, Ross Stearn (Sam Matthews, 60), Chris Zebroski (Craig McAllister, 46), Ben Williamson (James Constable, 80), Mark Yeates. Subs (not used): Michael Green, Cavaghn Miley. Eastleigh fell to their first defeat of the season at Woking. The Spitfires went a goal behind on the stroke of half time against the run of play as Inih Effiong fired past Ross Flitney. Ben Williamson hit the post and Chris Zebroski had a good chance to score when one-on-one. Defender Callum Howe also came close on his debut with a header that went just over. After the break, the hosts doubled their advantage in the 53rd minute when Eastleigh's Gavin Hoyte turned the ball into his own net when trying to deal with a dangerous delivery from goalscorer Effiong. Richard Hill's side were then awarded two penalties in quick succession in a frantic spell of action. Williamson missed the first and then moments later Ross Stearn was brought down in the box. 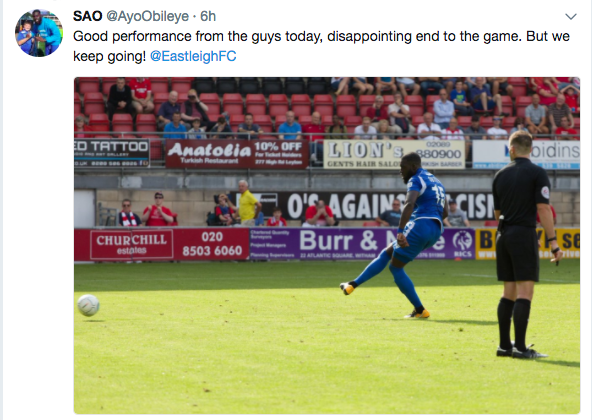 Ayo Obileye stepped up to score this time and pull a goal back for Eastleigh. Eastleigh finished the game with ten men as Hoyte pulled up with an injury with all three substitutions having already been made. 23-year-old centre-back Callum Howe has joined Eastleigh on loan until January from Lincoln City. Spitfires boss Richard Hill said: “I’ve known Callum and been a big admirer of his for quite a while. Howe started his playing career at Scunthorpe United. Since then he has gone on to play for Southport, Bradford Park and Alfreton amongst others. Callum goes into the squad for the fixture tonight against Woking and has been handed the number 27 shirt. 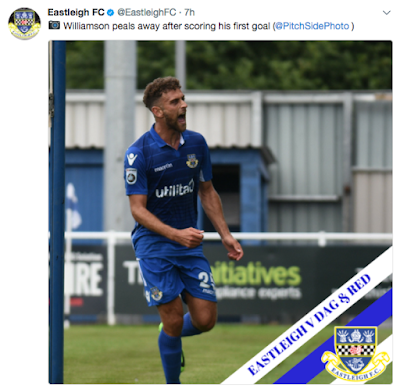 Eastleigh's unbeaten start to the season continued as Ben Williamson scored twice to make it three goals in two games for the new Spitfires striker. Richard Hill's side went a goal behind to a Corey Whitely strike in the 13th minute before a quick-fire brace from Williamson saw Eastleigh leading 2-1 at the break. His equaliser came in the 43rd minute when he combined with Danny Hollands before finishing. He then scored a penalty in first half stoppage time after Ayo Obileye was brought down in the area. Whitely drew the game level for the visitors when he grabbed his second goal of the afternoon from the penalty spot in the 74th minute. Eastleigh: Stack, Hoyte, Green, Togwell, Wood, McCallum (Zebroski 30), Yeates (Matthews 80), Obileye, Hollands, Boyce, Williamson (Constable 73). Subs not used: McAllister, Miley. Dagenham & Redbridge: Cousins, Pennell, Doe (Lokko 36), Robson, Hawkins (Cheek 77), Ferrier, Okenabirhie (Romain 71), N’Gala, Boucard, Ling, Whitely. 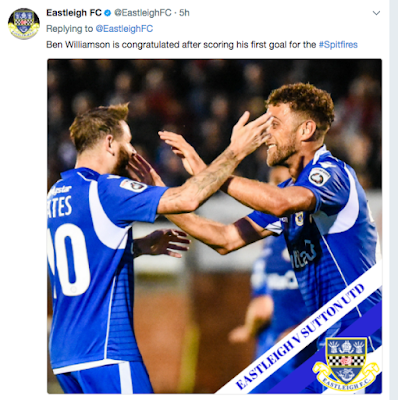 Ben Williamson scored on his home debut to help Eastleigh to a 1-0 victory over Sutton United. Spitfires boss Richard Hill said: “The first half wasn’t good enough and I let them know that at half-time. “We rode our luck at the start of the second half but what I liked was the lads’ commitment, attitude and endeavour. “After we went 1-0 up they found an over-my-dead-body attitude which is important in this league. “But on another night we could have been beaten comfortably, which is typical of this league. “It’s a great atmosphere here for the night games when the fans come out and support the team. But sometimes you have to give the supporters something to shout about and we didn’t do that in the first half. EASTLEIGH: Stack, Hoyte, Green, Togwell, Johnson, Wood (Constable 81), McCallum (Zebroski 70), Yeates, Hollands, Boyce, Williamson (McAllister 70). 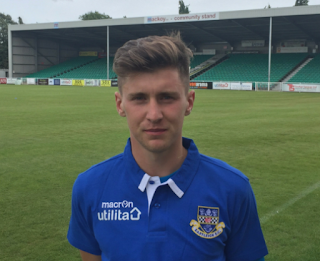 Eastleigh have signed 20-year-old midfielder Sam Matthews on loan from AFC Bournemouth until January. Matthews was part of Richard Hill's squad at the end of last season where he scored three goals for the Spitfires in nine appearances. “Sam is a player I like and deserves his chance," said Hill. "We've been monitoring Sam’s situation over the summer and once the chance was there for me to take him, I felt It was an opportunity I couldn’t miss. “Again, AFC Bournemouth have been excellent in this whole situation and have stuck to their word. "They had clubs from this division after Sam, and following our discussions in the summer they came to us first. Footage from Eastleigh's 0-0 draw at Bromley on the opening day of the season. Eastleigh began the new season with a 0-0 draw at Bromley. Eastleigh: Graham Stack, Gavin Hoyte, Michael Green, Sam Togwell (c), Reda Johnson, Andrew Boyce, Sam Wood, Danny Hollands, Paul McCallum (Craig McAllister, 75) Ben Williamson (Chris Zebroski, 67), Mark Yeates (Ross Stearn, 83). Subs (not used): James Constable, Ayo Obileye. Striker Ben Williamson, 28, has signed for Eastleigh having been released from League Two side Cambridge United. The ex-AFC Bournemouth, Port Vale and Gillingham centre-forward becomes the tenth new arrival at the Silverlake Stadium this summer. “I’m delighted to secure the services of Ben, especially with a list of National League teams after him,” said Spitfires boss Richard Hill. After youth spells with Millwall and Croydon Athletic, Lambeth-born Williamson kicked off his senior career on the south coast at Worthing before linking up with Glenn Hoddle at his academy in Spain. He joined the then League One Cherries in 2011, going on as a sub for Danny Ings in their play-off semi-final against Huddersfield Town. The striker, who is known for his strength and pace, featured for Eastleigh in Tuesday’s 2-1 friendly win at AFC Stoneham and has now linked up with the squad on a permanent basis and been handed the No25 shirt.